There has been a lot of talk about ALA's (previous) specification of including hate groups in meeting rooms. But while there has been a lot of focus on what could possibly happen if someone tries to hold a hate group meeting at the library, public librarian Lena Gluck pointed out on Twitter that we don't need to wonder - THIS has happened before. To multiple libraries. And she goes into detail about what exactly happened at each one. With her permission, we've shared her Twitter Thread below. If you would like to see the articles citing these cases, you can check out Safer Library Spaces where they list the articles out and provide brief explanations of each. We also linked her points back to the corresponding source in the message below for your convenience. On the subject of #NoHateALA I want to bring attention to something. The explicit welcoming of hate groups in the meeting room interpretation was justified with cases where libraries were sued by white supremacists. 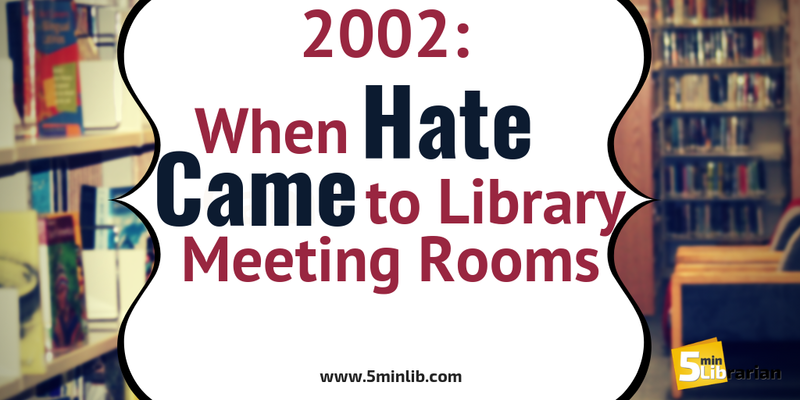 The citations at the bottom of the (now rescinded) revision included cases where white supremacists tried to use library meeting rooms, were denied, sued libraries, & won. But what isn’t remarked upon anywhere is that these cases involved the same white supremacist group— They used to call themselves WCOTC and were led by a Nazi named Matt Hale - mentions classifies them as neo-Nazis and they are known for being extremely explicit in their calls for genocide, and enacting those calls through violent hate crime & homicide using public library meeting rooms to hold rallies was their signature tactic in the early 2000s. From 2000 to 2002 WCOTC held rallies in Bloomington Public Library, Schaumburg Township District Library, Wallingford Public Library, Chicago Public Library, Tabb Library, Martin Memorial Library, Baltimore County Public Library, & Lucius Beebe Memorial Library. Make no mistake, this was not a ‘controversial’ group holding quiet meetings, this was literal Nazis systematic co-opting libraries to terrorize communities. Mark Bray writes in 'Antifa' about how antiracist activists worked with local kids of color to go around the police to reach the fascists as they were leaving the library. One Nazi drove through the crowd of protesters in a pick-up truck— 15yrs before Charlottesville. Local news reported a young girl was taken to the hospital by ambulance and that a Nazi skinhead pulled a gun on antiracist protesters. Twenty-five people were arrested. Picture living in this neighborhood and the trauma this meeting room reservation caused. In Tabb, WCOTC had a two-hour long rally in the library meeting room while they were guarded by 170 police officers with riot gear. The entire library had to close and police wouldn’t allow parking within a mile of the library. Think about this in material terms— to let Nazis use the meeting room, the city spent thousands of dollars and closed the entire library, shut down roads. So, Nazis were prioritized over every other member of the community who needed library service/materials that day. This is what it looks like when we prioritize Nazi speech— it looks like denying everyone else’s speech. It looks like silencing and kicking out PoC and Jewish folks. That’s how fascism works on a basic material level, and it’s intentional. Wakefield Library drew a direct connection between their own experience with this group in 2002 to the well-publicized Charlottesville rally of 2017. Ann McGonigle Santos, a member of the Board said, "Their racist chants, Nazi salutes and messages of hate are remembered by all who were there to witness it... We’re still fighting this fight. And to not have a national leadership that is embracing the fight that our little town of Wakefield did in 2002 is also shocking." The only reason this didn’t continue beyond 2002 is because Matt Hale got a 40 year sentence for plotting to assassinate a federal judge towards the end of that year. The US judge who gave the sentence was quoted saying: "I consider Mr. Hale to be extremely dangerous." PoC & Jewish folks in all the communities he terrorized KNEW he was extremely dangerous. Libraries KNEW he was extremely dangerous. Libraries tried to protect their communities and when they were stripped of their ability to, communities were forced to defended themselves. So when someone argues that public librarians must allow fascists to use our meeting rooms, know that these are the cases they’re referring to. And know that this argument is the exact same one made to deny libraries any agency in protecting their neighborhoods. It IS important to reference these cases, because it was an absolutely horrific campaign of violence orchestrated within library buildings. But we have a moral obligation to find ways to DEFEND & SUPPORT our libraries, not contribute to their powerlessness in this fight. We need to pour energy into legally and materially defending public libraries who stand up to dangerous fascist organizers to protect their communities. NOT pour energy into spinning our wheels talking about "slippery slope" hypotheticals. We don’t need to talk about hypotheticals- we need to talk about the material reality of librarians being rendered powerless to protect their communities & communities being traumatized by homicidal fascists. This isn’t a debate about Intellectual Freedom in the abstract this is the decision between supporting public librarians or hanging them out to dry when Nazis come to town. We are talking about the direction of our field as a whole, whether or not we will collectively stand in solidarity with individual libraries who take a stand. Do we support librarians and communities who fight even in the face of a legal system who won’t consider a fascist “extremely dangerous” until he threatens to kill a judge (after decades of explicitly of threatening to kill Black & Jewish people)? Or do we abandon them? That is the question antiracist librarians are asking of ALA. That is the question that will be answered in the new revision of the meeting room interpretation. It is scary to think this could happen again, just 16 years later. Have you checked your library's meeting room policy? Now is the time to evaluate it and see if you can make your library safer, before someone makes a request. (You can visit Safer Library Spaces for examples of how you can do this.) Let's learn from history instead of watching it repeat itself.